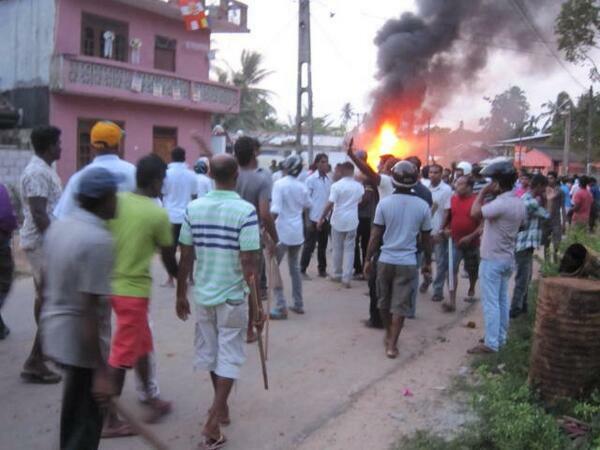 Anatomy of Anti-Muslim Violence: How “Bodhu Bala Sena” Mobs Caused Mayhem in Aluthgama and Beruwela TWO Years ago. 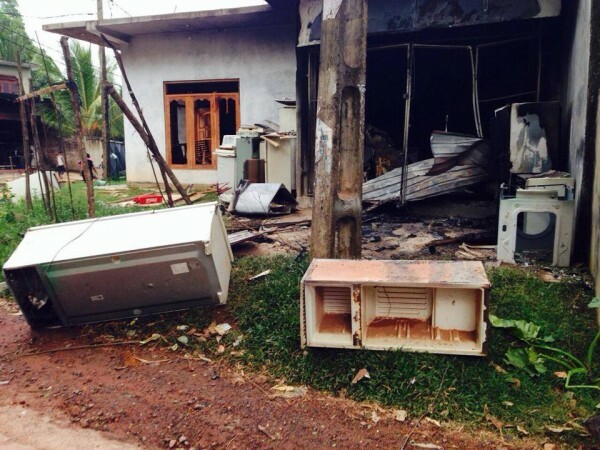 A curfew was clamped down in the Aluthgama and Beruwela Police divisions of Kalutara district in the Western Province of Sri Lanka following an outbreak of communal violence on Sunday June 15th 2014 that was triggered off by the “Ethno Religious Fascist” Organization the Bodhu Bala Sena (BBS). Preliminary reports indicate that the violence was sparked off by a protest rally conducted by the Bodhu Bala Sena – meaning “Buddhist Power Force” – in Aluthgama where provocative anti-Muslim speeches were made by prominent BBS leaders condemning an incident on Poson day (June 12th) in Aluthgama where a verbal altercation occurred between some Muslim youths on the one hand and a Buddhist monk and his vehicle driver on the other. Bodhu Bala Sena General Secretary Ven.Galagoda Aththe Gnanasara Thero delivered a provocative speech full of racist venom in which he asserted that the Police and military were Sinhala and that no Muslim or Tamil or anyone else could harm a Sinhalese and get away with it. “This country still has a Sinhalese Police, this country still has a Sinhalese Army. It will be the end of all if someone at least lays a finger on a Sinhalese,” Gnanasara Thero said.He also said he was prepared to be called racist for speaking out on behalf of Sinhalese.Gnanasara Thero called upon all Sinhalese to unite regardless of political differences.He also wanted the Muslim dominated area called Dharga Nagar or Dharga town renamed. Gnanasara Thero made several references to incidents in Aluthgama involving Muslims and criticised the Govt for the elaborate security arrangements in Aluthgama. Gnanasara Thero also was critical of President Rajapaksa saying “Mahinda Mahathaya” should be aware of how the minorities are empowering themselves at the expense of the majority community.The singer Madhumadhava Aravindha also appeared on the BBS platform and sang emotional songs in Sinhala that were highly inflammatory.At least 900 Policemen were on duty in the vicinity when the BBS rally was in progress. The BBS rally was attended by over 7000 people. Most of the attendees were outsiders transported for the rally and not from Aluthgama. After the BBS meeting ended at 5 pm a procession consisting of Buddhist clergy and laity led by BBS leaders had proceeded towards the Islamic Mosque in Aluthgama. The participants in the Procession were followed by a vehicle convoy in which members of another Ethno Religious fascist organization called the Sihala Ravaya also joined in. The procession chanted rabid anti-Muslim slogans. Around 150 to 200 youths and young Bhikkus were at the front of the procession. When the procession passed through areas where Muslim houses and shops were visible those at the front started attacking them. Stones were thrown.Windows and doors were smashed. In many instances attempts were made to set fire. Molotov cocktails or petrol bombs were thrown.Muslim families started fleeing from homes. Muslim youths then assembled together and tried to block the procession from proceeding.There was a face to face confrontation between both groups. Some Muslim youths also threw stones at the procession in retaliation.The Police then intervened on behalf of the BBS processionists and tried to disperse the Muslim youths. The cops who did not try to prevent BBS violence now turned on the Muslim youths and even fired tear gas shells. Fearing an attack on their place of worship,hundreds of Muslims gathered at the Marikkar Street Mosque in Dharga town in a bid to defend it from possible attacks. Threafter many more violent elements began arriving from outside in vehicles.They clambered down from the vehicles and commenced targeting Muslim establishments and homes. Groups of persons with fuel cans and weapons like clubs and rods had joined the processionists . While one segment of the original BBS procession tried to continue towards their target destination others began scattering in different directions. Very soon a different scenario emerged where groups began targetting Muslim homes living amidst Sinhala people in mixed neighbourhoods. The assailants were mainly outsiders and not from the neighbourhood. Bells started pealing in Buddhist temples. When people gathered at the temples they were exhorted to join the “holy war” and teach the Muslims a lesson. Prior to the BBS meeting in Aluthgama a great deal of anti-Muslim hate mongering had prevailed in social media like Facebook,twitter etc where overt threats of violence were made including remarks like “shall we bring a can of petrol” etc. In the violence which had erupted after the BBS demonstration and march several houses and businesses belonging to Muslims were attacked.Stones were thrown.Persons belonging to both Buddhist and Islamic faiths were injured in physical clashes when Muslims acted in self –defence in a bid to counter the attacks.Initial reports said that the Police seemed unwilling or unable to restrain the mobs.Buddhist monks uttered insulting remarks against Police officials who watched seemingly “helplessly” while hoodlums went about targeting Muslims. The anti –Muslim violence spread to nearby Beruwela where there is a substantial Muslim population. The Mollimala temple in Maradana,Beruwela was a hive of activity with bells pealing incessantly and anti-muslim elements moving in and out of the premises frequently.Historically Beruwela is of great significance as the place where Arab seafarers had first beached in Sri Lanka.Many Muslims in Beruwela trace their lineage back to several centuries. Beruwela situated 35 miles away from Colombo is also home to many rich Muslim gem merchants. With their homes under attack several Muslim families left their houses and sought refuge in Mosques and Schools. Thousands gathered at the Mosque in Dharga nagar and Walipitiya. Thousands of Muslims from Beruwela town and Ambepitiya also sought safety in the Jamiyah Naleemiya Arabic College in Beruwela that was established by the great Muslim businessman and philanthrophist Naleem Hadjiar. Anti-Muslim violence began spreading. Many Muslim owned businesses were attacked.According to UNP Western Provincial councillor Ifthikar Jameel who is also UNP organizer for Beruwela 41 Business establishments have been attacked.Of these 11 have been completely gutted. Several houses were also attacked.Most houses were stoned or smashed with poles.A Montessori pre-school for little kids was vandalised. More than 500 Muslim households were affected states Ifthikar Jameel. There were several incidents of arson and many buildings were set ablaze.According to Muslim Congress MP Mohammed Aslam at least 25 houses have been gutted completely.A very large number of buildings have suffered extensive damage.Several vehicles owned by Muslims were damaged or burnt.The Fire Brigade was called in to quell the spreading fires.Among establishments set on fire was a Muslim owned Garments factory on Milton Road that employs many Sinhala workers. Incidents of Violence occurred in Dharga town,Cheenawatte, New town,Ambepitiya, Mahagoda, Kotapitiya, Adhikarigoda and Meeripenna in the areas of Aluthgama and Beruwela.Several Buildings and dwellings on Sapula Kanda road,Masjid Road,Hospital road.Lotus road,Milton road and Simon Silva road were damaged in the attacks.Two mosques in Adhikarigoda were torched. Three other Mosques were attacked.A medical clinic run by a Sinhala doctor was also attacked.Several media personnel trying to cover the incident were assaulted by the mobs. One of the frightening features of the violence was that of mobs trying to forcibly set houses on fire with family members including children inside. Some of those in the forefront were in yellow,maroon and saffron robes. Loud threats were uttered that Muslim women would be raped. This led to many Muslim families running away from their homes and hiding in the bushes of nearby shrub jungles.Most Muslims escaped physical harm by fleeing to Muslim places of worship and schools. Thousands of Muslims who sought refuge at the Walipitiya Masjid and at Naleemiya Arabic College were greatly endangered when hundreds of hoodlums led by the BBS encircled the premises thereby trapping the hapless Muslim families inside. Several in the mob were well armed and shots were fired. 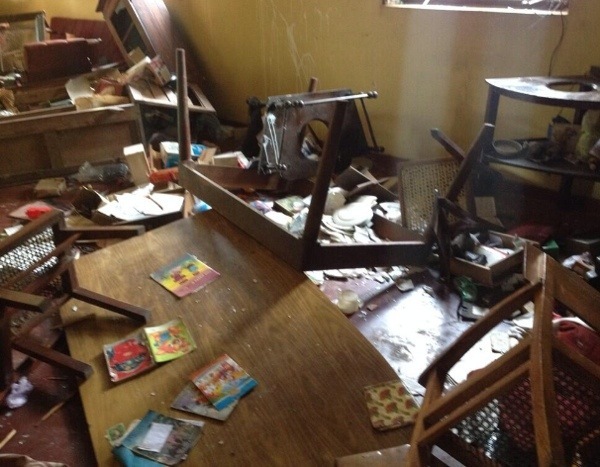 Some Muslim youths armed themselves with swords and knives and confronted the mob targeting Walipitiya mosque. Stones were thrown at each other.There was a direct confrontation that went on for more than two hours. Again the mob consisted of unknown persons who were not from the locality. When this confrontation was on another group arrived from another direction in a vehicle and opened fire on the Muslim youths defending their Mosque and families. The injured persons were taken into the Madrassah)Quaran School) and given first aid as they could not be transported to hospital due to the prevailing situation.SLMC Leader and cabinet minister Rauff Hakeem told the BBC that Three Persons died in the incident.Another Seven were injured in the shooting incident.All were Muslims.The identity of the people who fired on the Muslims trying to defend the Mosque is unknown yet. But suspicions have been raised that the gunmen were either defence personnel in civils or ex-servicemen. An elite police force official who declined to be identified told Reuters that a group traveling in a vehicle shot at Muslims who tried to prevent them from attacking the mosque. Three were killed and seven sustained gunshot injuries. Residents were unable to communicate with each other due to the curfew and congestion of mobile phone networks. Much of the violence took place in the dark as power had been cut off in the area as part of the orchestrated plan to attack Muslims. Telephone land lines also did not work. Transport along several roads were also blocked. Many passengers arriving at the Aluthgama railway station were stranded on the premises as they could not go to their homes. The situation was brought under control by the rapid deployment of the Police Special Task Force(STF) The STF dispersed the mobs besieging Walipitiya Mosque and Naleemiya College. The STF apparently fired rubber bullets and tear gas shells. A noteworthy feature of the violence in Aluthgama and Beruwela having a substantial Muslim population is that the targets in both places have been Muslims and Muslim owned houses,vehicles, businesses and Muslim places of worship.No Sinhala owned businesses have been targeted by Muslims. 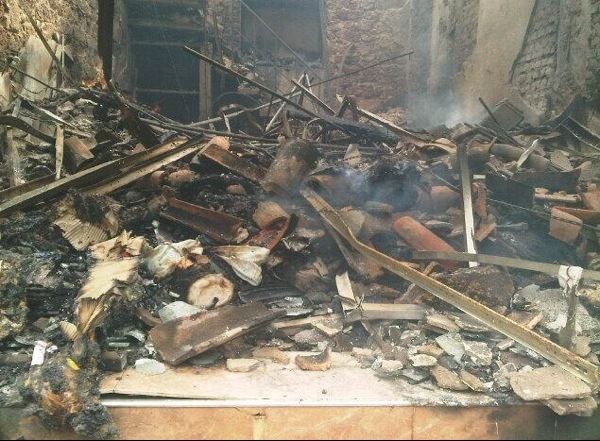 Even the Sinhala owned medical clinic that was attacked was apparently targeted by Sinhala elements.The Sinhalese who sustained injuries were very few when compared to Muslim casualties.Some Sinhalese were injured by Muslim youths in self -defence while others were injured by the Police and STF personnel. Thus it would be erroneous to report that the violence was a communal or race riot. It was not.Neither was the violence spontaneous.Instead it was a well planned coordinated exercise aimed at destroying the economy of the Muslims in the area. The primary instigators was the ethno religious fascist Bodhu Bala Sena. Journalists interviewing Sinhala residents of the affected areas found most people expressing their sorrow and regret for what had happened. They emphasised the fact that they had nothing to do with the violence and that the perpetrators were unknown outsiders transported from elsewhere.There were several instances where Sinhala neighbours and friends had provided shelter to endangered Muslims.Many blamed the BBS Bhikkus for instigating the violence and the Police for not preventing it. Over Sixty persons have sustained major injuries in the violence.Thirty -Six injured persons were admitted to the Kalutara base hospital in Nagoda.These included six police officers and two Buddhist monks. Seven persons with gunshot injuries were also admitted here.Another Seven persons including a Police officer have been admitted to the Beruwela District hospital.Ten persons including a STF officer are receiving treatment at the Aluthgama Rural hospital. Over twenty persons have received treatment at the Dharga town Govt hospital.While most of those who got treatment for injuries have left the hospital two comparatively serious patients emain at the hospital still.Over a hundred Muslims consisting of elders, women,children and youths have sustained minor injuries not requiring hospitalisation. The explosive situation in Aluthgama and Beruwela was further exacerbated by the conduct of the Police. Mobs were freely moving around as late as 9 pm and engaging in violence even after the curfew was officially declared at 6.45 pm. Cops were passive bystanders in most instances. Muslim residents state that the Police used tear gas on Muslims trying to defend their loved ones and property but did not lift a finger against Buddhist mobs.They also allege that the Police prevented Muslim families from leaving their houses and seeking safety in Mosques. In some instances the Police seemed to have collaborated with the violent elements and cooperated in the looting of Muslim valuables and movable assets.Extensive looting of Muslim homes and shops went on under cover of the curfew with active and passive collaboration by the Police.The looters came in lorries and trucks behind Police vehicles and systematically cleared valuables from the buildings vacated by Muslims who had fled seeking safety. Mohamed Faiser, a 45-year-old shop owner, said police broke into his shop and an adjoining mosque. Another group followed and torched both buildings.Many other Muslim residents also told Reuters that the police directly and indirectly helped the BBS organization. Police rejected the claim. It was after the deployment of 400 STF personnel that the situation was brought under control.However some Muslims of the area expressed dissatisfaction over the conduct of the STF also. Many others were full of praise for the STF.Journalists visiting the area on Monday June 16th found many Muslims blaming the Police STF for not arriving at trouble spots on time and delaying by even three hours in some instance.The Police STF justified their position by saying that they could not proceed quickly as they were obstructed by mobs who accused them of being Sinhala traitors aligned to Muslims. Power and Telecommunication failures in Aluthgama and Beruwela for hours also heightened fears.The tense situation in the area along with the unofficial media blackout practised by most mainstream media organs resulted in exaggerated rumours about the situation spreading like wildfire.A very pertinent aspect of the violence was the fact that most of the perpetrators were outsiders to the area transported in BBS controlled vehicles. Elaborate preparations had been made to attack Muslim establishments and torch them. Some of the mobsters were well armed and are suspected of being linked to the armed forces. It is now stated that the situation is currently under control though another outbreak cannot be ruled out if the BBS is allowed to run amok again. No arrests of any BBS leader or follower has been made so far according to reports received.However some Muslim youths possessing swords have been arrested.Some of the STF personnel on duty opined apologetically to visiting journalists that the Buddhist monks were responsible for instigating violence. 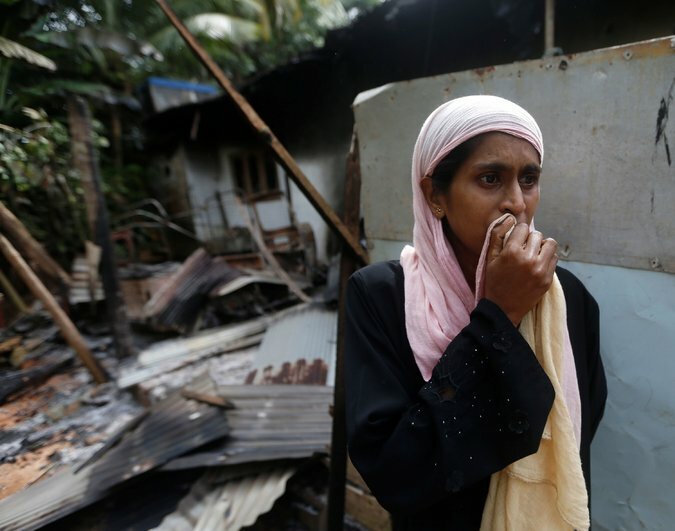 A Reuters team in Aluthgama and Beruwela witnessed an uneasy calm and a heavy police presence, with Muslims worried for their safety, many of them sitting on the road in front of their gutted houses. Police urged people to stay inside their homes. “A curfew is imposed for your own safety. Do not come out of your houses,” they said through loudspeakers.Ambepitya residents who sought refuge earlier at Naleemiya Arabic College have now started moving to Al-Humaisara National School. Cabinet Minister and Sri Lanka Muslim Congress leader Rauff Hakeem, JVP leader Anura Kumara Dissanayake and Investment Promotion Deputy Minister Faiszer Mustapha were in the troubled areas in a bid to ease tensions and bring about calm. Initially Rauff Hakeem and Anura Dissanayake had not been allowed to enter the troubled areas but later the “ban”was rescinded. SLMC leader Rauff Hakeem and Mohammed Aslam MP visited the beleagured Muslims at Walipitiya and obtained first hand accounts of what had happened. A visibly moved Hakeem stated that he was ashamed that he could not protect members of his community from violence despite being a cabinet minister. “I just can’t understand a government which prevents even a trade union or student protesters going to protest marches … allowing the BBS to conduct the meeting,” Rauf Hakeem, justice minister and the leader of the country’s largest Muslim party, the Sri Lanka Muslim Congress, told Reuters.He said Muslims in the area had repeatedly requested authorities to provide them with security. According to a Reuters report Faiszer Mustapha was trapped when he visited a college in Beruwela, a tourist town 60 km (35 miles) from the capital Colombo, where hundreds of Muslims had taken refuge from the violence.”There were groups of people who did not allow the minister to move out of Jamia Naleemia (college), where hundreds of Muslims have come for safety. However, with the police help he came out after an hour,” a ministerial aide told Reuters. All right thinking people in Sri Lanka are appalled and horrified by the irresponsible decision to allow an organization like the BBS to to conduct a protest rally in Aluthgama where the situation was extremely volatile following the June 12th incident. A verbal altercation on Poson poya day between a Buddhist monk and Muslim youths had been distorted and exaggerated to convey an impression that a Buddhist priest had been assaulted by Muslim youths. This led to mobs including Buddhist monks converging around the Aluthgama Police station and demanding action against the alleged Muslim assailants. At least six businesses owned by Muslims were attacked on that day(12th).Cabinet minister for Transport and Kalutara district MP Kumara Welgama was hooted at by crowds and his vehicle attacked for trying to calm the situation. The Inspector General of Police refused to declare curfew on June 12th because it was “poson”poya day . However the Police Special Task Force(STF) was deployed in Aluthgama and the situation was brought under control on Thursday night. The Bodhu Bala Sena General Secretary Gnanasara Thero issued a statement then criticising Muslims over the June 12th Aluthgama incident and accused the Police of “living inside Mosques” meaning that the Police was partisan towards Muslims. When the BBS made preparations to stage a rally in Aluthgama on Sunday several reputed Muslim organizations made representations to the IGP and Senior Police officials that the proposed event be disallowed. Several Muslim leaders from Rauff Hakeem to Faiszer Mustapha made entreaties that the BBS event should be disallowed.The BBS protest was however given the green light despite Muslim misgivings and fears. Although large contingents of Policemen were deployed in the area concerned, the BBS event deteriorated into serious anti-Muslim violence as feared by responsible sections of Sri Lankan society. According to a Reuters report the BBS had said its members had been protesting peacefully, against an assault on a Buddhist monk by a Muslim youth three days ago, when they came under attack. “It was an unfortunate incident. It shouldn’t have happened. There are damages and casualties to both the parties,” said Dilantha Vithanage, a spokesman for the BBS to Reuters.In a statement on Monday, Gnanasaara said the BBS had not been involved in the clashes and blamed them on “an extreme Muslim group” that had picked a fight with the Sinhalese. The BBS has said its members came under attack when they were protesting peacefully against an assault on a Buddhist monk by a Muslim youth three days earlier.Before the clash, the general secretary of the BBS, Galagoda Aththe Gnanasaara, warned Muslims against attacking Sinhalese, the majority of whom are Buddhist. “We still have Sinhala police in this country, still we have a Sinhala military. From today, if any Muslim… mishandles any Sinhalese, that will be the end of them,” he said at a public rally that was captured on video and downloaded on YouTube. Video clips of Gnanasara Thero’s speech show very clearly that the man in yellow robes is not a pious monk but more akin to a mad,frothing canine spouting racist venom. Yet not a single Sinhala political leader of stature has condemned this menace in “Ran Salu”.Meanwhile the BBS is preparing to conduct a press conference and present its side of the story. Attempts were also made to promote anti – Muslim violence in places like Dehiwela,Matugama and Panadura after the Aluthgama-Beruwela furore.There was an abortive attempt to torch a Mosque in Panadura. A muslim owned pharmacy in Dehiwela was stoned.Mobs also allegedly converged in Bentota but were dispersed by the Police.Six livestock farms owned by Muslims were raided in Matugama. Several goats were driven away and slaughtered. 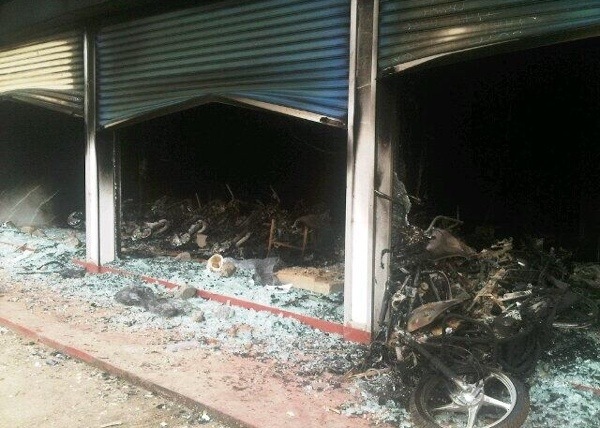 Two Muslim shops were ransacked in Kalutara. Meanwhile the two Muslim youths who had voluntatily presented themselves to the Police after the June 12th incident where a Buddhist monk was allegedly attacked and another were produced at the Kalutara courts. The trio produced in courts included a Moulavi who had accompanied the youths to the Police station. On June 12th two motor cycles parked on the road by the Muslim youths had obstructed the motor vehicle of a Buddhist monk. The driver had scolded the youths in harsh language and uttered racist remarks. This resulted in the Muslim youths also replying in the same vein.When the Buddhist monk also started scolding the youths he too had been chided in return.One youth had also yanked the hand of the driver.This incident was distorted and a false allegation made that the Buddhist monk had been assaulted by Muslims. In a controversial development lawyers practising at the Kalutara courts refused to appear for the Muslim youths accused of assaulting a Buddhist monk.. Two Muslim Lawyers from Colombo had to go to Kalutara and watch the interests of the Muslim youth. Unconfirmed reports state that the Muslim youths had been severely assaulted and tortured in Police custody.It is alleged that some Buddhist monks went to the Police station and severely assaulted the Muslim youths with the connivance of the Police. Meanwhile Prime Minister DM Jayaratna presided over a conference at the Kalutara district secretariat to discuss the situation.Many cabinet ministers attended the conference.It was pointed out to Rauff Hakeem at the meet that only two persons were killed in the shooting incident.Other reports however state that three were killed and six of the injured are in critical condition. There were signs of anti-Muslim violence erupting again when a large mob including persons in robes attempted to march towards Dharga town in the evening of Monday June 16th saying the area needs to be renamed according to the wishes of BBS General Secretary Ven. Galagoda Aththe Gnanasara Thero.However Special Task Force Personnel and the anti-riot squad of the Police stationed in the vicinity restrained the mobs from proceeding.A heated argument took place. When the mob tried to break through the Police cordon the STF and anti-riot squad fired tear gas shells and dispersed the mob.The situation appeared to be quiet at nightfall.